Acute lymphoblastic leukemia (ALL) is a malignant neoplasm caused by the proliferation of blast cells. The blast cells are poorly differentiated precursors of the lymphoid cells. They replace the normal elements of the bone marrow and decrease the production of normal blood cells; therefore, they cause anemia, thrombocytopenia, and neutropenia. They can also infiltrate other organs, such as liver, spleen, lymph nodes or, less frequently, central nervous system (CNS). Ocular involvement in ALL is not uncommon. Reddy and Jackson reported that 49% of ALL patients had retinopathy at initial diagnosis, such as intraretinal hemorrhages, leukemic infiltration, white-centered hemorrhages, central retinal vein occlusions, and vitreous hemorrhages. However, exudative retinal detachment is a rare complication. Visual disturbances during pregnancy are often associated with preeclampsia and are rarely explored. However, this sign may evoke a serious pathology that may be life-threatening. 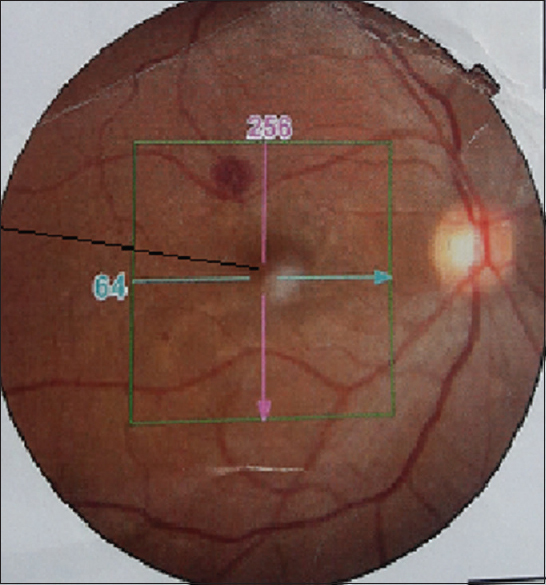 That is why we report an unusual case of a pregnant woman who presented with bilateral serous macular detachment with associated retinal leukemic infiltration as the sole sign of pre-T-ALL. A 34-year-old female presented to the ophthalmology department at 28 weeks' gestation of her second pregnancy (Gravida II) with insidious onset of painless diminution of vision in her right eye first and then both eyes. She was diagnosed with hypertensive retinopathy and was referred to our department with suspicion of preeclampsia. She presented a medical history of severe headache at the time of onset of ocular symptoms. Her past ocular and medical history was insignificant. On ocular examination, best-corrected visual acuity was 2/10 in the right eye and 1/10 in the left eye. Intraocular pressure on applanation tonometry was 14 mmHg in both eyes. Fundus examination revealed bilateral serous detachment of the macular area [Figure 1]. The optic nerve head and peripheral retina presented no pathological findings. Optical coherence tomography revealed prominent and partly confluent cystoid detachment of the retinal pigment epithelium (RPE) in both eyes [Figure 2]. The patient was advised to undergo routine blood investigations and a physician checkup. Physical examination revealed a fever (38.5°C). The blood investigations revealed white blood cell count (WBC) of 29 × 103/μl and peripheral blood smear showed presence of 50% blast, anemia (7.4 g/dL), thrombocytopenia (90,600/L), no other abnormalities were detected. We decided to wait until 30 weeks' gestation to provide more time for fetal maturity. The patient had an uneventful delivery via cesarean section of a baby girl of 1.7 kg with Apgar score of 9–10 (neither leukostasis nor hemorrhagic syndrome was noted). The day after cesarean, she was referred to the department of hematology where bone marrow examination was performed, revealing increased cellularity with 90% blast cells. The patient was diagnosed with ALL type B (CD10+) using immunophenotyping. Cytogenetic and fluorescence in situ hybridization analysis showed a t (9; 22) confirming the diagnosis of Ph+ ALL. Intensive systemic chemotherapy (GRAAPH regimen + intrathecal therapy + spycel) was scheduled and initiated immediately. After two cycles of chemotherapy, complete remission was achieved; there was rapid resolution of the subretinal fluid and her vision returned to 10/10 bilaterally with resolution of all ocular symptoms. The ophthalmic manifestations of leukemia can either occur primarily due to direct infiltration of ocular tissues by blast cells, or secondary as a result of hematologic abnormalities, such as CNS involvement or opportunistic infections. Zimmerman was the first to report vision loss in leukemic patients in 1964. Ophthalmic manifestations of leukemia are varied.,, Leukemic manifestations can be seen in almost all ocular structures; retina is the most common site of involvement. The most common manifestations include venous dilation and tortuosity. Retinal hemorrhages can occur at all levels, and are usually in the posterior pole and can be accompanied by a white center that consists of leukemic cells, platelet-fibrin aggregates, or septic emboli. In addition, cotton wool spots can be a presenting sign of leukemia, caused by clusters of cells occluding arterioles. It is uncommon, however, for ALL to present with visual complaints. Specifically, serous retinal detachment as the initial sign of ALL has only rarely been reported.,,,,,,,,,,,,,, Only one was also found to be Philadelphia chromosome positive. The mechanism is hypothesized to be due to leukemic infiltration into the choroid producing decreased blood flow in the chorio capillaries. The resulting ischemia to the overlying RPE and disruption of the intercellular tight junctions is thought to lead to the development of an overlying serous detachment. The involvement of the choroid by leukemic cells tends to be perivascular and choroidal thickness has also shown to be significantly increased compared to normal. The differential diagnosis of bilateral exudative retinal detachment includes central serous choroidopathy, Harada's syndrome, scleritis, uveal effusion, age-related macular degeneration, and metastatic neoplasm. While leukemia has been reported to masquerade as other ocular and systemic disorders, clinical examination and fluorescein angiography can help narrow the differential. Central serous choroidopathy is high on the differential in the presence of subretinal fluid and a thick choroid, especially in a young human. However, it is less likely to be associated with retinal hemorrhages and cotton wool spots. Fluorescein imaging in this case was similar to what one would expect with Harada's; however, there was no associated inflammation or other systemic findings to support this diagnosis. In our case, the differential diagnosis of bilateral exudative retinal detachment can also include preeclampsia. In fact, exudative (or serous) retinal detachment occurs in <1% of patients with preeclampsia and in 10% with eclampsia, although preeclamptic and eclamptic women with hemolysis/elevated liver enzymes/low platelet count syndrome may be approximately seven times more likely to develop a retinal detachment than those who do not have the syndrome. Exudative retinal detachment tends to be bilateral, diagnosed postpartum, more frequent in primiparous women, and more common in women who undergo cesarean delivery; it tends to resolve completely postpartum. Fluorescein angiographic findings support the hypothesis that retinal detachment in preeclampsia/eclampsia is secondary to choroidal ischemia from intense arteriolar vasospasm. The RPE usually resorbs the subretinal fluid postpartum, and visual acuity typically returns to predetachment levels within weeks. Treatment generally involves prompt systemic and intrathecal chemotherapy. Local irradiation is also an accepted treatment modality; however, adverse risk factors are common, especially in adult patients. Exudative serous macular detachment may be the initial sign of ALL, among other types of leukemia. 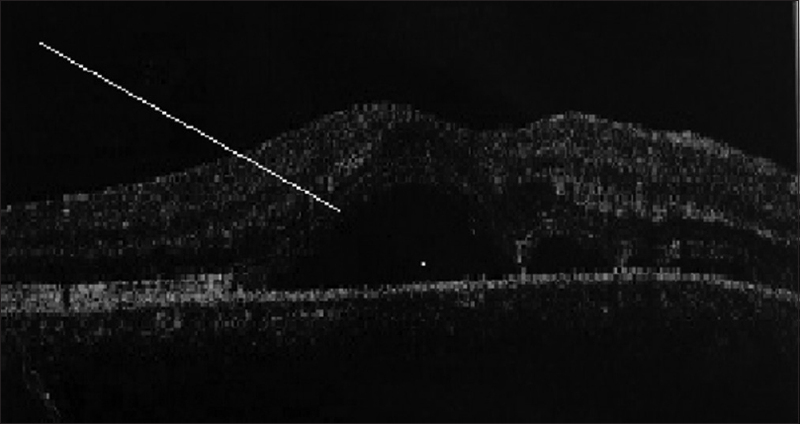 A sudden appearance of unilateral or bilateral exudative retinal detachment, even in an adult, warrants a thorough systemic screening for the underlying leukemia. Therefore, we suggest that ophthalmic examination, including fundus examination, at diagnosis is crucial for ALL patients, especially for those whose WBC count is very high at onset. Reddy SC, Jackson N. Retinopathy in acute leukaemia at initial diagnosis: Correlation of fundus lesions and haematological parameters. Acta Ophthalmol Scand 2004;82:81-5. Zimmerman LE, Thoreson HT. Sudden loss of vision in acute leukemia. A clinicopathologic report of two unusual cases. Surv Ophthalmol 1964;9:467-73. Javier Mateo J, Ascaso FJ, NuěnŢez E, Peiro C, Gonzaělez G, Cristoěbal JA. Ophthalmological Manifestations in Acute Lymphoblastic Leukemia. In: Faderl S, editor. Novel Aspects in Acute Lymphoblastic Leukemia. Rijeka, Croatia: InTech; 2011. Reddy SC, Jackson N, Menon BS. Ocular involvement in leukemia – A study of 288 cases. Ophthalmologica 2003;217:441-5. Talcott KE, Garg RJ, Garg SJ. Ophthalmic manifestations of leukemia. Curr Opin Ophthalmol 2016;27:545-51. Stewart MW, Gitter KA, Cohen G. Acute leukemia presenting as a unilateral exudative retinal detachment. Retina 1989;9:110-4. Abdallah E, Hajji Z, Mellal Z, Belmekki M, Bencherifa F, Berraho A. Macular serous detachment revealing acute lymphoblastic leukemia. J Fr Ophtalmol 2005;28:39-44. Yoshida A, Kawano Y, Eto T, Muta T, Yoshida S, Ishibashi T, et al. Serous retinal detachment in an elderly patient with Philadelphia-chromosome-positive acute lymphoblastic leukemia. Am J Ophthalmol 2005;139:348-9. Candoni A, Simeone E, Bandello F, Fanin R. Leukaemic infiltration of the retina at onset of Philadelphia-positive acute lymphoblastic leukaemia revealed by stratus optical coherence tomography. Br J Haematol 2006;133:455. Thill M, Schwartz R, Fiedler W, Linke S. Bilateral retinal pigment epithelial detachment as the presenting symptom of acute myeloid leukaemia. Eye (Lond) 2006;20:851-2. Kim J, Chang W, Sagong M. Bilateral serous retinal detachment as a presenting sign of acute lymphoblastic leukemia. Korean J Ophthalmol 2010;24:245-8. Yoshida K, Hasegawa D, Takusagawa A, Kato I, Ogawa C, Echizen N, et al. Bullous exudative retinal detachment due to infiltration of leukemic cells in a child with acute lymphoblastic leukemia. Int J Hematol 2010;92:535-7. Golan S, Goldstein M. Acute lymphocytic leukemia relapsing as bilateral serous retinal detachment: A case report. Eye (Lond) 2011;25:1375-8. Karaman S, Gülkilik G, Vural S, Aydın B, Polat N, Kizilkaya O, et al. Serous retinal detachment in a pediatric case with acute lymphoblastic leukemia as a first sign of leukemic relapse. J Hematol Transfus 2014;2:1014-16. Johnson JS, Lopez JS, Kavanaugh AS, Liang C, Mata DA. A 25-year-old man with exudative retinal detachments and infiltrates without hematological or neurological findings found to have relapsed precursor T-cell acute lymphoblastic leukemia. Case Rep Ophthalmol 2015;6:321-7. Tufts Medical Center, Liang MC. Bilateral serous retinal detachment as a presenting sign of acute lymphoblastic leukemia in an adult. Clin Stud Med Case Rep 2015;2:1-2. Vieira L, Silva NA, Medeiros MD, Flores R, Maduro V. Acute lymphoblastic leukemia presenting with bilateral serous macular detachment. Arq Bras Oftalmol 2015;78:382-4. Patel AV, Miller JB, Nath R, Shih HA, Yoon MK, Freitag SK, et al. Unilateral eye findings: A Rare herald of acute leukemia. Ocul Oncol Pathol 2016;2:166-70. Sharma H, Majumder PD, Rao C, Biswas J. A case of acute myeloid leukemia masquerading as unilateral exudative detachment. Am J Ophthalmol Case Rep 2016;4:47-9.